(Left) Mr. Isaac Farris, nephew of Dr. Martin Luther King, Jr., with Antony Taliath of Gandhi Foundation USA and Viren Mayani. Dr. Martin Luther King, Jr.’s epic public speech, “I have a Dream,” was made on August 28, 1963 during the March on Washington for Jobs and Freedom. In it, Dr. King called for an end to racism in the United States and sought civil and economic rights. Exactly 54 years later, his statue on the Georgia State Capitol Building lawns was unveiled. Although legislation for the installation was approved by Hon. Governor Nathan Deal and the House in 2014, the statue had not come to fruition as the original sculptor was killed in a car accident. Now, as the nation ponders the race issue again, the peace apostle’s statue has arrived in our sight. Dr. King’s appearance here is young, scholarly, and lifelike. He faces east towards the sunrise, to remind us all of the forward looking leader he was, and the peaceful coexistence that Georgia’s diverse communities are proud to have maintained since then, over the decades. 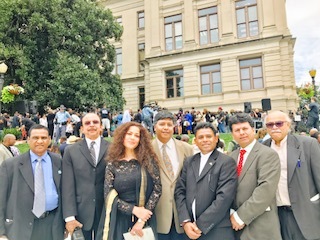 The relevance of his presence on the Georgia State Capitol lawns should be a matter of pride to all Indian-Americans, as Dr. King’s life’s success was significantly influenced by Mahatma Gandhi’s Satyagraha and civil disobedience movement, and just like him, Dr. King was also assassinated at a time when his disruptive presence was most needed. The statue was unveiled with over 500 elected officials, community leaders, and people of varied races and origins in attendance on the bright sunny morning, with a feeling of resilience in the quiet, cool air. Amongst those present were patrons of the Gandhi Foundation of USA, there to express gratitude to the King family, who have enshrined the life-size statue of the Mahatma at the entrance to the King Center, and in particular for Mrs. Coretta Scott King, who generously provided a Gandhi Room on the 1st floor of the building to showcase Gandhi ji’s life and the success of his struggle for independence. History shall always remember the might of the simple loincloth-clad man who rocked the British Empire without a bullet fired! 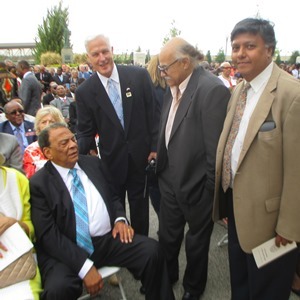 (Left) Ambassador Andrew Young with Gandhi Foundation's John Naugle, Subash Razdan, and Viren Mayani. Speakers and people honored for their contribution in the work it took to have this leader’s presence outside the State Capitol included Gov. Nathan Deal; Rev. Bernice King, Daughter of Dr. King and CEO of the King Center, and other King family members; Lt Gov. Casey Cagle; Mayor Kasim Reed; Rep. Calvin Smyre, Chairman of the Dr. Martin Luther King, Jr Memorial Statue Tribute Committee; Speaker of the House David Ralston; and Dean Lawrence Carter Sr. of the MLK Jr. International Chapel at Morehouse College. Prof. Timothy Miller of Morehouse College provided music. (Left) Patrons of the Gandhi Foundation with Consul for Community Affairs Mr. D. V. Singh of the Indian Consulate. 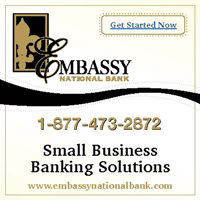 Remember, we have Website Bonus Features that are not in the print magazine. Every time you see the W symbol in the print magazine, you can go to our website to see additional print or audiovisual material!